Alli Smalley, hittin' the final women's FG in Beard-Eaves. Ever. An awful lot of athletics teams I’ve been personally familiar with begin their preseason preparations by listing their goals for the year, starting with the basics–like, say, beating Rival X or winning an area title–and working up to the major championships. Usually the first goal on the board is: Have a winning season. It’s as simple a team-sports goal as there is: win more games than you lose. It’s kind of too bad that in major college basketball, of course, a winning season and 99 cents will get you the proverbial cup of coffee; when you can pad your win totals by playing nearly half your slate against the Alabama St.’s and Sam Houston St.’s Central Floridas Troys Georgia Southerns of the world, topping .500 is sometimes more of a measure of how cowardly you scheduled than how well you played. Still, neither of Auburn’s two basketball programs entered this season able to just look the gift horse of a winning year in the mouth. For the men, only two of their previous six seasons have finished on the positive side of the ledger. For the women, the loss of four dominant starters and a roster featuring just one senior meant that just keeping their heads above water while waiting for better times would be an accomplishment. The Win: 74-59 at home over LSU. The poor Bayou Bengals are very likely the worst SEC team in recent memory, entering this game all alone in the league cellar at 1-12 and leaving it at 1-13. Auburn needed not just to win this game but to dominate it, and they did, jumping out to a 9-2 lead, never trailing, and never leading by fewer than 9 in the final 8 minutes of the game. So, yeah, that was nice. The Schedule: home against Miss. St. Wednesday, at Alabama Saturday, followed by the SEC Tournament. Auburn still has a shot at the No. 3 West seed, but it’s a longshot: we’d need Arkansas to lose at Tennessee (doable) and at home to Ole Miss to even get into a 7-9 tiebreaker. The Rebels will be fighting to get back in the NCAA discussion and should be plenty motivated, but the Hogs have been pretty good at home. More likely is that Auburn slips to No. 5 by losing to State and then at Alabama, propelling the Tide to the No. 4 spot. Most likely of all, though, is that Auburn heads to Tuscaloosa all but locked in to the No. 4 seed; the 4-10 Tide have a midweek roadie at South Carolina, and a loss there coupled with an Auburn win vs. State will clinch no worse than fourth place for the Tigers. 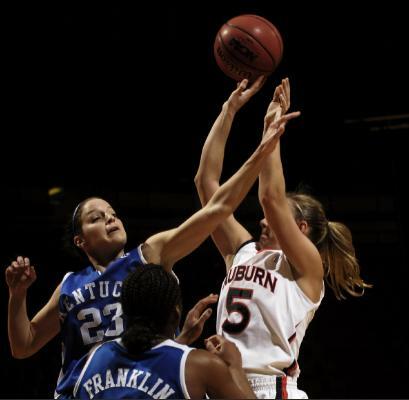 I wish that was something to celebrate, but that means Auburn’s most likely SEC tourney opponents would be as follows: first Carolina, who manhandled Auburn in Auburn to open the SEC season, and then–in the event of a win–Kentucky. Why they could get there: Auburn’s suddenly shooting the lights out at home. Led by the unconscious Tay Waller–who’s now scored 29, 29, and 26 points his last three games without taking more than 15 shots in any of them–Auburn has combined to shoot 51 percent from the floor in their last three home games. The opponents were Georgia, Arkansas, and LSU, but still: that Auburn dispatched all three with ease should bode well for their meeting with Mississippi St., as does Auburn having already taken the Bulldogs to OT in Starkville in the worst-officiated game of the Tigers’ season. While you don’t want to read too much into one performance, freshman Earnest Ross likely earned himself more minutes by stoning LSU star Tasmin Mitchell Saturday. Mitchell scored a season-low six points while Ross played a season-high 29 minutes and racked up 4 steals. Ross won’t offer a whole lot offensively, but Auburn’s been crying out for a true frontcourt defensive stopper, and maybe Ross is ready. Why they might not: That Alabama game. Auburn has improved over the past couple of months and has shown itself plenty capable of taking care of business against lesser SEC competition, going 4-1 against the other three teams with losing league records and coming within a whisker of sweeping Arkansas. But despite two overtime games and a list of blown leads too depressing to recount, the bottom line is that Auburn has won all of one SEC game away from home … and that one came at LSU. Ross’s “break out” against LSU, while welcome, also illustrates what’s wrong with the team; we’re 29 games into the season, and Jeff Lebo’s still tinkering with the rotation. Auburn’s maddening lack of consistency from game-to-game is why, and another reason why trying to predict future results from them based on prior performance is useless. Arbitrary guess at odds of winning season: 40 percent. To make it happen, Auburn essentially has to win, in order: 1. game against NCAA-quality team the likes of which they haven’t beaten all season 2. SEC road game against a team with a pulse, which they haven’t done all season 3. first-round SEC tournament game against quality competition to cap five-game winning streak. The Win: 75-63 over 14th-ranked Kentucky. Auburn exploded out of the gate in the second half, turning a 27-21 halftime lead to a 41-26 advantage within five minutes. They cruised from there to improve to 14-15 overall and 5-11 in SEC play. The inside-outside tag-team duo of Alli Smalley and Keke Carrier combined for 39 points on 16-of-27 shooting. The win was Auburn’s third upset of a top-15 team this season. The Schedule: The women’s regular season is done. They’ll face seventh-seeded Florida in the first round of the SEC Tournament Thursday in, uh, Duluth, Ga. Winner between the Tigers and Gators gets to face–whaddya know–Kentucky. Winner there gets either Georgia or Mississippi St.–two teams already crushed earlier this season. In other words, this draw–which puts both Tennessee and longtime Fortner nemesis Vandy in the other half of the bracket–is as good as Auburn could reasonably hope for. Why they might make it: To finish above .500 Auburn’s going to have to win all three of the above games, but the Tigers have shown you really, really can’t put anything past them. If Smalley’s hitting her shots and Carrier is avoiding foul trouble, there’s no one in the league they can’t beat. (Well … maybe the Vols.) They showed against Alabama and Arkansas there’s no one in the league they can’t lose to, but if those losses matter a ton when it comes to a winning record and possibly making the women’s NIT, they don’t matter a lick in determining whether they can hang with the Gators and ‘Cats. Why they might not: Eh, they still finished 5-11. If Auburn showed they can play with the league’s heavy hittiers, they also showed they can get blown out by both the heavy and the light hitters. If Smalley’s not hitting her shots and Carrier gets hit with a couple of quick fouls, forget it. It doesn’t help that talented freshman PG Morgan Toles continues to be as up-and-down as, well, a talented freshman PG; even in the win over Kentucky, she committed 6 turnovers to 4 assists and went 3-for-10 from the floor. Arbitrary guess at odds of winning season: 25 percent. Auburn has to be taken seriously in any individual game … but they’ve been riding this roller coaster of a season too long for me to expect them to rip off three big upsets in a row. Which is OK, of course. Fortner and everyone save Carrier will be back next year to smooth things out. As well know: it’s on the men’s side where the real drama is this spring. So the girls have three wins against top 15 teams? That’s awesome. They’ll be dangerous against anyone in the SEC tournament. Glad to see the bracket will draw up in their favor. Wouldn’t that be something if this little bunch could string something together and do something that last year’s team couldn’t? As far as the fellas; man, LSU is awful. It looked like they brought up a fan bus — there was a tiny little section of yellow up there in the upper deck that actually got a little audible at times. I thought I smelt something when I walked in. Had to be a long ride back to the swamp.